I don't understand why anyone would buy this. It is extremely overpriced olive oil. If you really believe that an olive oil distributed for cosmetic use is really honestly more pure than olive oils sold for human consumption and actually regulated by the food and drug administration, I have a bridge I can sell you....You can buy an equivalent, probably better quality organic olive oil for much less money and, bonus, you can cook with it too. Talk about multi-use. I love this light moisturizer. 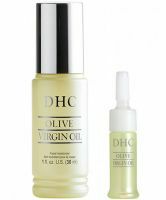 It is a bit pricey for olive oil, but it is the perfect consistency and goes over my skin perfectly. The little bottle does last a long time and it is a great light-weight moisturizer. In the dead of winter I usually have to add a bit of a heavier cream, but this is my favorite summer moisturizer. It also keeps my skin soft and balanced. Do not use it if you are a teenager. It didn't break me out or anything but it is a bit too oily. I would recommend this for dry skin.